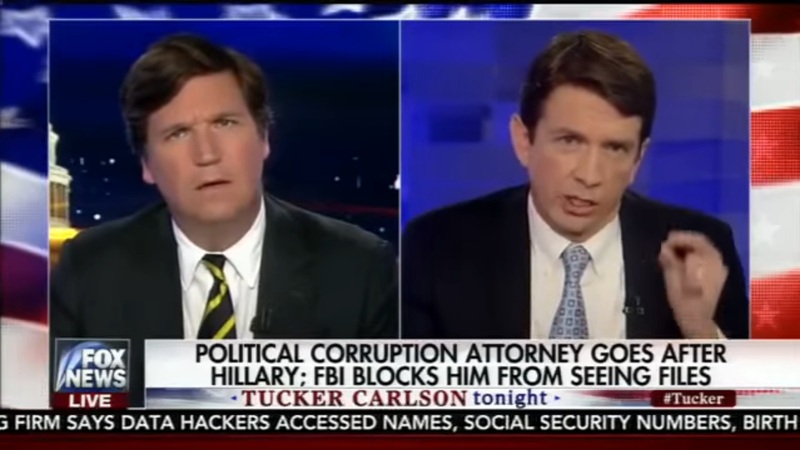 A lawyer chasing the FBI for information on Hillary Clinton appeared on Tucker Carlson to explain the lie he’s being fed that blocks him from obtaining the information he needs. Ty Clevenger is a lawyer looking for the files the FBI refuses to release that would show that they are preventing any investigation into Hillary Clinton’s emails. While speaking to Tucker, Clevenger explained how he’s filed FOIA (Freedom of Information Act) requests that have been denied and he wonders out loud whether President Barack Obama is still running the show at the FBI. Tucker asked for clarification, whether this meant that “not a matter of public interest” meant that it’s not good for the public to have access to the information, or whether it’s that the public doesn’t care. Clevenger explained that in this case, the FBI are saying that the public doesn’t care. Clevenger explained that he’s not asking for anything out of the ordinary, only the same files that Congress has already asked for. He went on to allege that the Former FBI Director, James Comey, has already decided he would exonerate Hillary and that the FBI is still trying to cover its rear end, which includes blocking those files from being released. Over 30,000 pieces of evidence remain to be seen by the public. We’ve been following the FBI’s excuse that preventing release of the files is due to a “lack of public interest,” and I we won’t stop until every last file is available.